All of our meals are planned to provide the nutritional needs to young children. The meals we provide are ‘homemade’ on site from fresh, quality produce, using Halal meat from our local butcher, and organic fruit and vegetables from a local producer. We adhere to strict health and hygiene policies and are inspected regularly by the local authority, receiving the highest grade 5. We limit the use of sugar and do not include salt or artificial ingredients in our meals and snacks. Individual dietary needs are catered for regarding cultural, religious or medical needs. We always use fresh fruit and vegetables and milk is available daily at snack time with fresh drinking water nearby at all times. 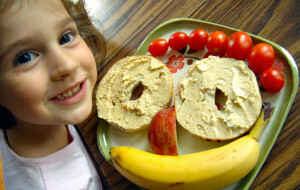 We believe that meal times should be a sociable occasion where children can develop independence in making choices, serving food and drink and feeding themselves, we also involve children in preparing their own snacks or healthy juices. Our menus consist of foods from each child’s cultural background, familiar foods as well as introducing them to new ones. Through discussions with parents we find out about religious festivals and enjoy these with the children where special celebration meals are prepared. We actively promote weaning with foods freshly prepared, blended, mashed or chopped depending on your baby’s needs. Our menu is adapted to meet your baby’s needs and we work closely with parents to share information on your child’s food/ milk intake to ensure their individual needs are met. Nursery staff can also offer advice if needed if you are unsure of anything.